Well, our loquat tree has relieved me of my preserving duties, but many of you are still waiting on your loquats. I opted to pickle my final harvest, and boy am I glad I did. They’re deelish! This project requires you to peel the little buggers. It’s worth it though as the loquat skins don’t tenderize with cooking. 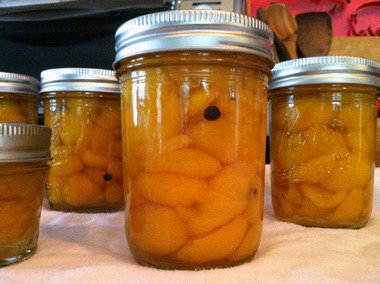 This recipe is based on Linda Ziedrich’s recipe for pickled peaches, in the Joy of Pickling. Bring mixture to a boil, reduce heat slightly and allow to simmer for 8 minutes. Remove from heat and place brine pot next to where you’re working for step 3. 3. Peel loquats by slicing off the stem end and slicing them in half from pole to pole. Pull them apart at the stem end and the inner membrane surrounding the seeds might even slide out all in one. You don’t really have to remove that part, but your pickled fruit will be prettier if you do. Definitely remove the seeds (and then make stonefruit/almond liqueur!) The outer skin should sheet off easily from ripe halves. Place peeled loquats directly into the brine. 4. When all your loquat halves are in the brine, return the pot to heat and bring it to a boil, reduce the heat slightly to a low boil for about 5 minutes. 5. 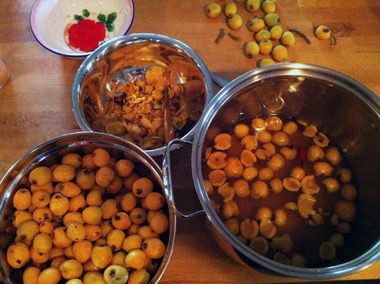 Fish out your cinnamon stick bits and ladle loquats into warm jars. Fill jars with brine, bubble the jars to remove excess air from the interior and top with enough brine to leave 1/2” headspace. Wipe rims, seal with two piece lids and process for 10 minutes. Enjoy them all summer and fall in salads, over savory dishes, straight from the jar, whatever.